Then there is my True Fitness trolley bag which weighed up to barely 6 kilos. 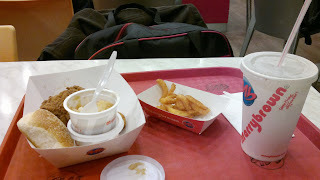 I am just at Marrybrown now ordered a Lucky Plate costing abt RM16.70(tax inclusive). For travellers heading to Australia, there is a rescreening of luggage at the waiting hall. Further too, there will be some inspectors asking about visa and immigration questions stationed in the hall. All travellers, citizens of Australia or not are subject to the questioning. Ok, people, see you guys in a bit. Continue to stalk my blog for updates on my trip around Australia!